Are you considering converting the space above your garage into a bonus room? Or, are you looking to build an in-law apartment above your attached garage but don’t know where to begin or what contractor to hire? Would you like to develop your own room addition construction plan, and cost estimator breakout spreadsheet, to compare contractor bid sheets? Do you know what questions to ask to ensure your hiring the right contractor for your room addition over the garage project? Avoid a home improvement project disaster! 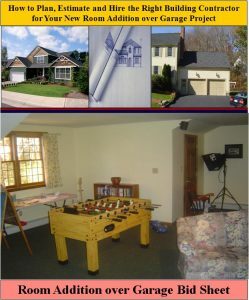 The Room Addition over Garage Bid Sheet (Immediate Download) provides you with the knowledge on how to plan a room addition project, and what to look for when hiring contractors for your new garage room addition. It also includes a detailed cost breakdown table and free Excel spreadsheet for estimating your own room addition building costs. Ensure that your Room Addition over Garage project goes smoothly and you get the finished living space you are looking for. Help keep your room addition project on budget and on time! Order and Immediately Download the Room Addition over Garage Bid Sheet today. The Room Addition over Garage Bid Sheet costs only $17 and is 100% guaranteed. The 28 page Room Addition over Garage Bid sheet includes a request for proposal (RFP) form that you submit to the prospective general contractor(s) for them to complete and provide back to you for review. The RFP form consists of over 180 questions on all aspects of the construction of your room addition. In addition, the Room Addition over Garage Addition Bid Sheet provides extensive and important advice to the homeowner on how to work with a general home contractor and his sub-contractors in order to ensure your Room Addition is built the way you want it to be. Finally, it provides a list of manufacturers for key building products for the home. The Room Addition over Garage Bid sheet also provides estimated room addition building costs and time intervals for each phase of the room addition project, as well as a spreadsheet form for entering your own addition costs.